When people are out and about, they leave plumes of chemicals behind them—from both car tailpipes and the products they put on their skin and hair. In fact, emissions of siloxane, a common ingredient in shampoos, lotions, and deodorants, are comparable in magnitude to the emissions of major components of vehicle exhaust, such as benzene, from rush-hour traffic in Boulder, Colorado, according to a new CIRES and NOAA study. "We detected a pattern of emissions that coincides with human activity: people apply these products in the morning, leave their homes, and drive to work or school. So emissions spike during commuting hours," said lead author Matthew Coggon, a CIRES scientist at the University of Colorado Boulder working in the NOAA Earth System Research Laboratory. D5 Siloxane, short for decamethylcyclopentasiloxane, is added to personal care products like shampoos and lotions to give them a smooth, silky feeling. Siloxane belongs to a class of chemicals called volatile organic compounds (VOCs); once applied, they evaporate quickly. In the air, sunlight can trigger those VOCs to react with nitrogen oxides and other compounds to form ozone and particulate matter—two types of pollution that are regulated because of their effects on air quality and human health. Coggon and his colleagues measured VOCs from the roof of NOAA's Earth System Research Laboratory in December, 2015 and January, 2017, and from a mobile laboratory driving around Boulder in February, 2016. Among other measurements, they tracked the concentrations of traffic-related compounds, including benzene, commonly used as a marker of vehicle exhaust, during rush hour. "We were surveying the air, monitoring every species our instrument was sensitive to—about 150 compounds," said Coggon. From that soup of chemicals, one compound caught their attention. "We found a big peak in the data but we didn't know what it was," he said. Patrick Veres, a NOAA scientist and co-author on the paper, suggested siloxane, and he was correct. Because the siloxane emissions correlated with the benzene emissions from traffic, Coggon's team figured this was also a chemical in vehicle exhaust; so they tested tailpipe emissions directly and took roadside measurements. They couldn't find it. Since siloxane and benzene weren't coming from the same source, Coggon and his colleagues realized that they had nevertheless linked both chemicals to a particular human behavior: Commuting. By studying their data hour-by-hour, they realized siloxane emissions peaked in the morning, when people put on personal care products and went outside into their cars or buses. That's when benzene emissions went up too. 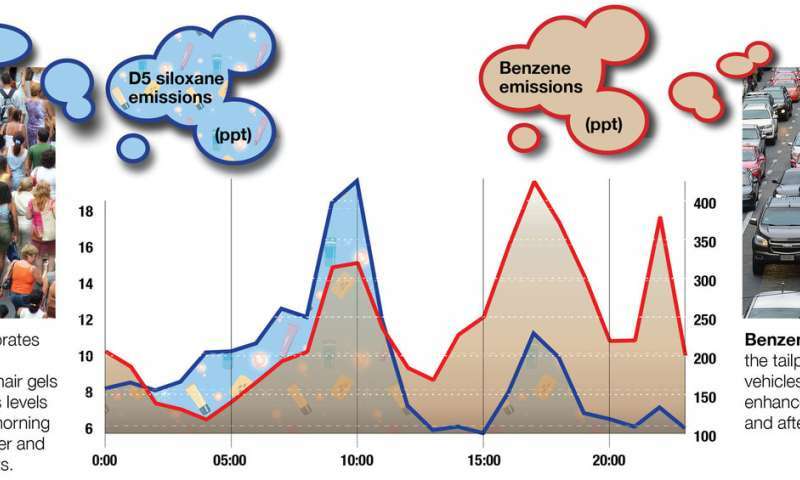 Emissions of both chemicals decreased during the day, then peaked again during the evening commute. The evening peak of siloxane emissions was lower than in the morning, since the personal care products had largely evaporated throughout the day. "That daily pattern of emissions is what's key," Coggon said. "It resembles people's activities." This study is part of an emerging body of research that finds emissions from consumer and industrial products are important sources of urban air pollution. A recent study in Science, led by CIRES and NOAA's Brian McDonald, found that consumer and industrial products, including personal care products, household cleaners, paints, and pesticides, produced around half of the VOC emissions measured in Los Angeles during the study period. "This study provides further evidence that as transportation emissions of VOCs have declined, other sources of VOCs, including from personal care products, are emerging as important contributors to urban air pollution," McDonald said. The new study also demonstrates that siloxane is a good indicator of of the presence of emissions from personal care products. "Siloxane is a marker," said Coggon. "Now we have a very good tracer for understanding the emissions patterns of other VOCs emitted from personal care products." The research team is looking at other chemicals in personal care products that correlate with siloxane—one likely candidate is fragrance compounds. Coggon predicts they may also spike in the morning, as people commute. "In this changing landscape, emissions from personal care products are becoming important," Coggon said. "We all have a personal plume, from our cars and our personal care products. It's likely that emissions from personal care product also affect the air quality in other cities besides Boulder and L.A. Our team wants to learn more about these understudied sources of pollution."